Through pottery analysis, we can obtain information about the nature of activity on the Temple Mount during each period. The pottery can be dated by analyzing the materials and the shape of the vessel. 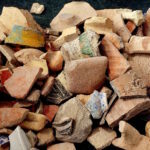 Hundreds of thousands of fragments of pottery vessels were discovered in the sifting. Much of it is from the time of the First and Second Temples.